Photo courtesy of Darryl Arnold. Only good for stains and fingerprints. 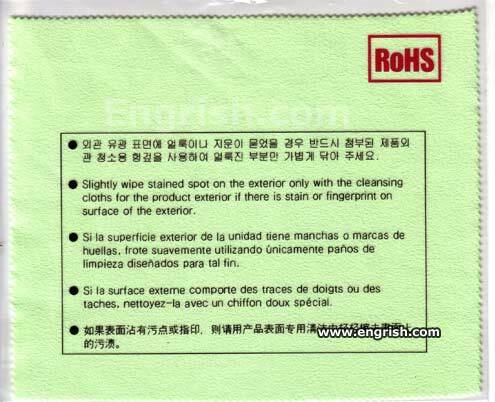 How does one “slightly wipe”? It’s like being a “little bit pregnant”. Speaking of which, can it be used for TP, too? Careful! Never ever wipe the interior. Do you have something to clean the interior surface of the interior? Slightly wiping the exterior is what caused the stain in the first place! But only if you can read this entire sentence out loud without fainting. The Chinese have a firm belief that too many periods in one place will bring about a demon. Only use on the exterior, or we’ll kick you in the posterior. Make your inferior exterior, superior! This one is a cleansing cloth,… and THIS cloth is for something else, so don’t use it. Only at Lowes. I mean, Rohs. Not recommended for interior use. Interesting, the only poorly-written instructions are in Engrish, the Spanish and French ones are okay. Exterior-so, that’d be the inside, right? No! Slightly not. Wipe, or wipe not. There is no slightly. Slightly wipe the interior posterior of the exterior surface of the exterior. They must think that Americans are slow. The other languages don’t have it so redundant.
. . . Bonvolu alsendi la pordiston. Lausajne estas rano ena bideo. How about the anterior surfaces? In Soviet Russia, exterior cleans YOU. How do the makers of the cloth know there is a stain on the exterior of whatever this cloth is made for cleaning? Is the quality control THAT bad for this thing (whatever it is)? I am a man. Do I not bleed ? I have an exterior, Does it not stain ? I’m annoyed because the Engrish.com logo is covering the Chinese part, so that I cannot read it. Note: The Spanish portion is actually written perfectly. The French version is perfectly fine. The Spanish there is perfect. This is definitely not from Kuala Lumpur or Singapore. Thailand probably.